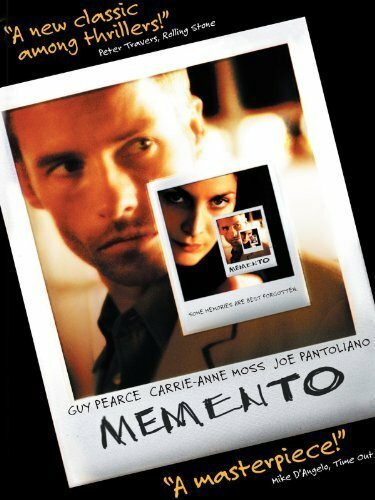 Guy Pearce, Carrie-Anne Moss and Joe Pantoliano star in Christopher Nolan’s critically acclaimed psychological thriller Memento. Watch the movie trailer below. A man (Pearce), suffering from short-term memory loss, uses notes and tattoos to hunt for the man he thinks killed his wife. MPAA Rating: R for violence, language and some drug content. Directed by Christopher Nolan (The Dark Knight Rises and Interstellar), this Academy Award-nominated film is a mind-bending thriller whose mesmerizing power grows with every viewing. Guy Pearce stars as Leonard, a man with a bizarre disorder: the inability to form new memories. Ever since that fateful night when his wife was murdered, anyone Leonard has met, or anything he has done, simply vanishes from his mind. Who are his friends? Who are his enemies? What is the truth? The answers change from second to second as Leonard seeks vengeance for his wife’s murder…and sinks into an abyss of uncertainty and danger.